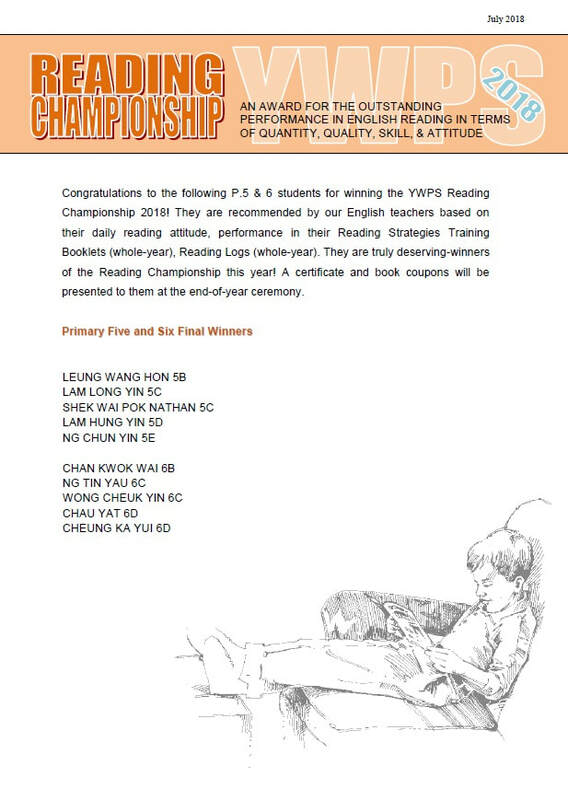 To recognize the effort of active readers, the English Department of YWPS is glad to run the “Reading Championship” (since 2014) for our P.5-6 boys. 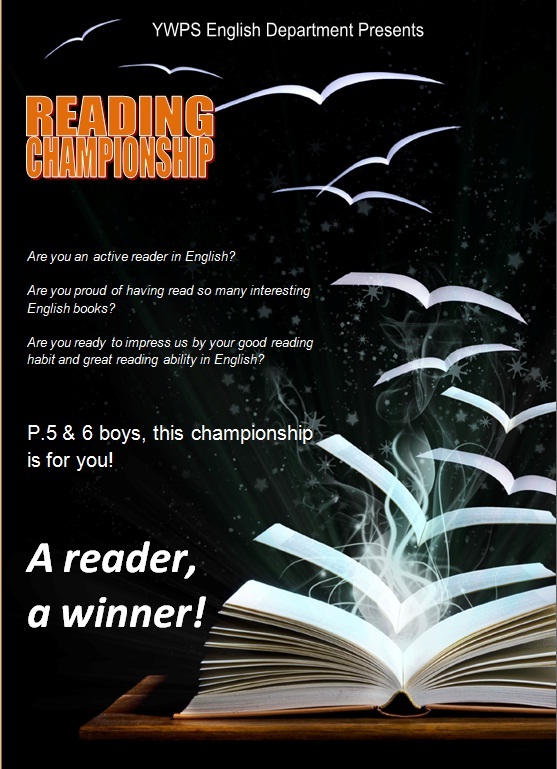 For those of you who have a genuine passion in English reading, this is a great opportunity for you to be awarded. Any current YWPS student of P.5-6 may be nominated by their English teacher according to their daily reading habit, reading performance and reading attitude for the academic year. 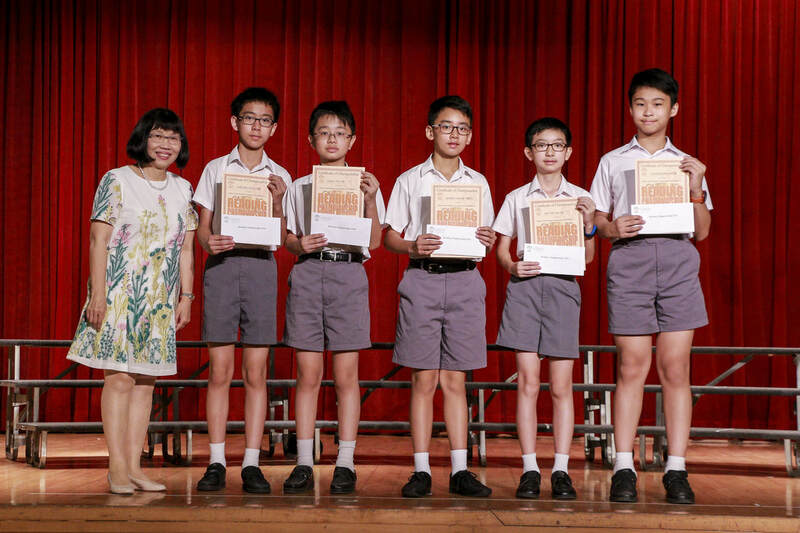 A total of 6 students in maximum from each class (P.5-6) would be nominated for screening. There are TWO rounds in this contest to select the final FIVE WINNERS for each level! 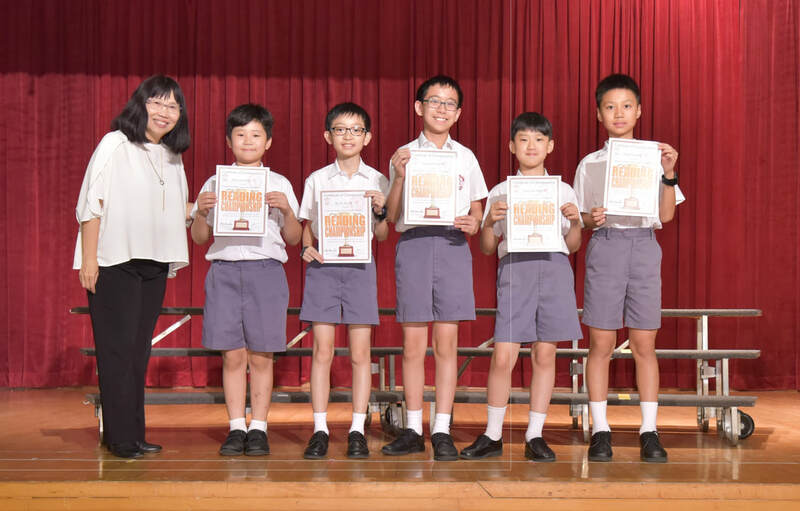 The judges will be looking for evidence showing that the contestants have been reading a wide range of English materials with skills and quality reflections. 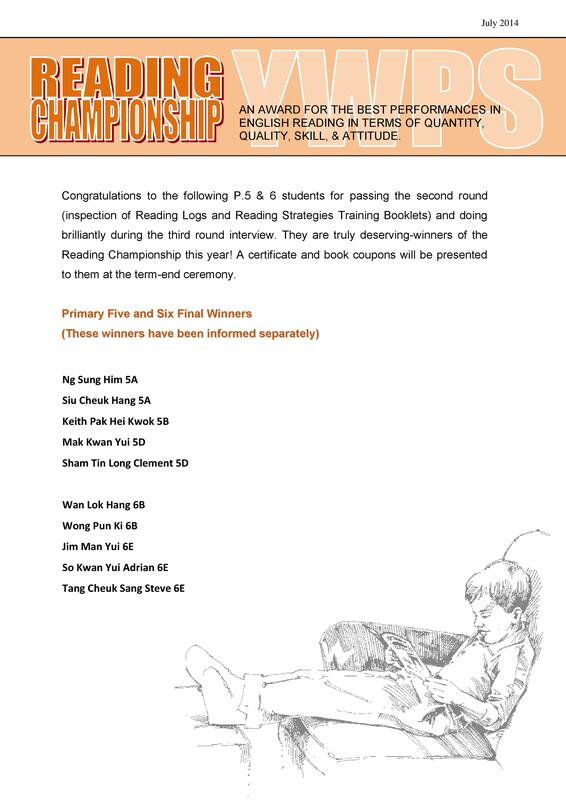 10 people from each level enter the 2nd round. d) any other relevant matters that come up during the interview. 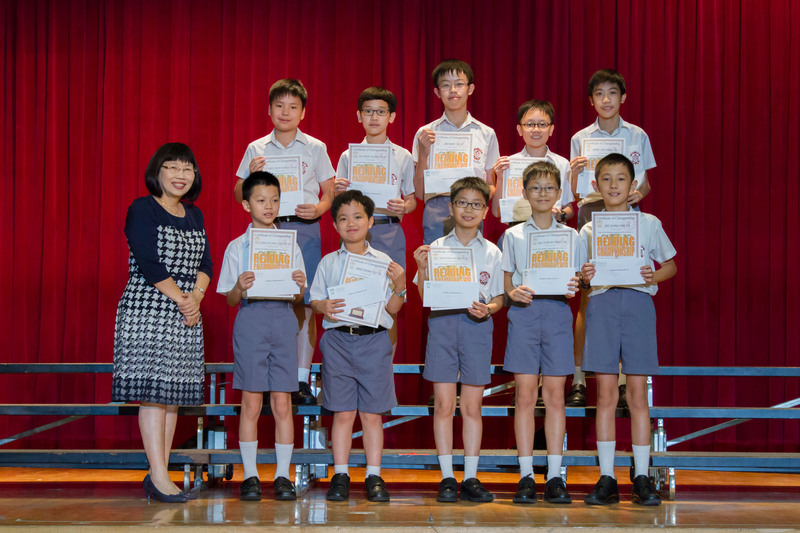 Final winners of each level will be chosen after the interviews, to be approved by Headmistress. Nomination will be done in May/June and selected students will be informed. 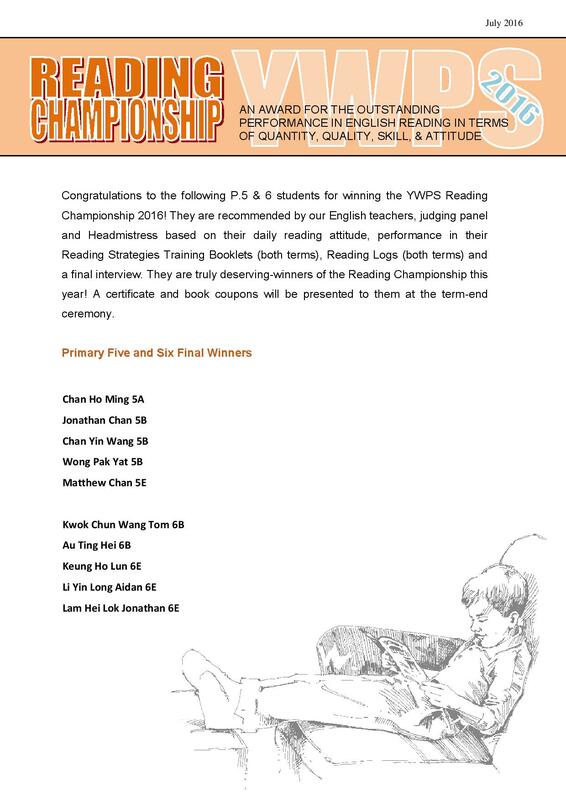 The P.5/6 interviewees will face a judging panel and discuss on their reading habit and skills. 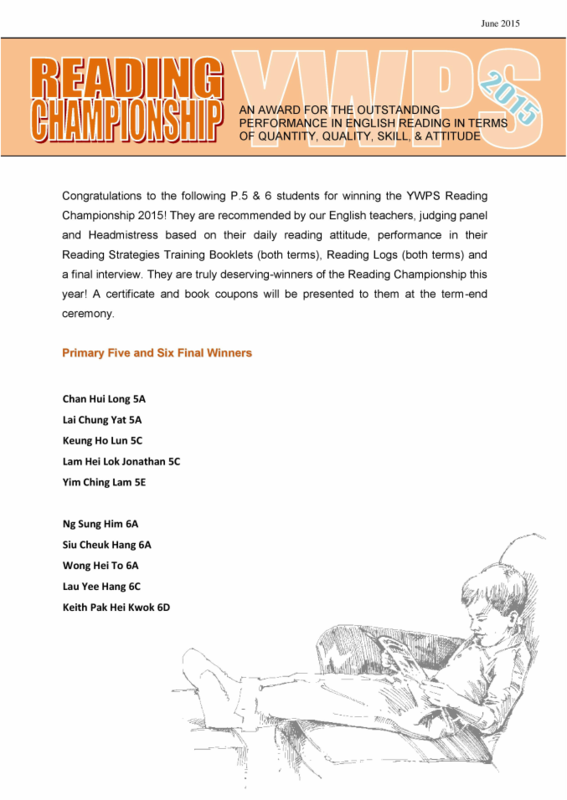 Final winners, upon approval from Headmistress, will be announced by the end of June. 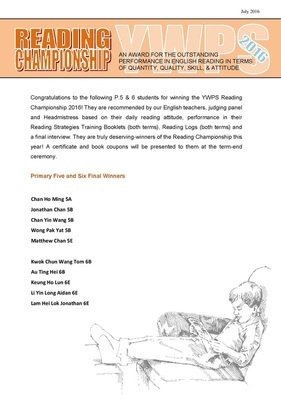 Each winner will receive a certificate and a book coupon. 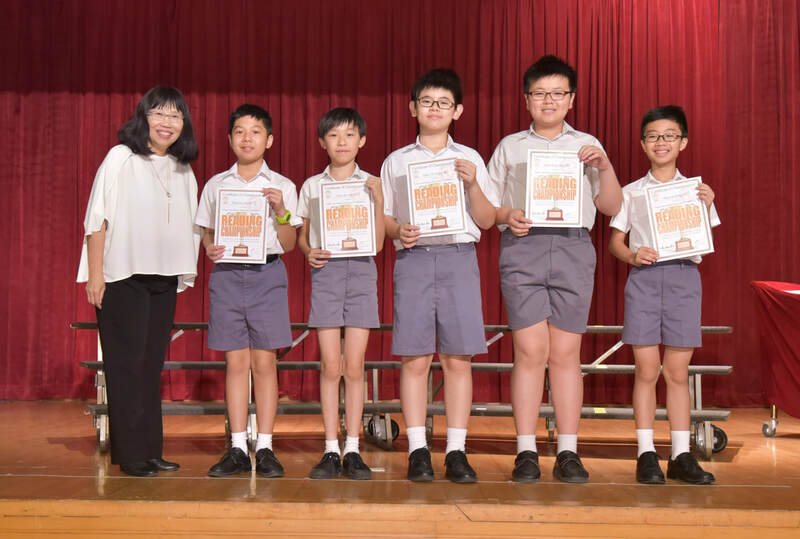 Headmistress Mrs Lam presented the Reading Championship certificates to the 10 deserving winners on 11 July 2017 at the year-end ceremony. 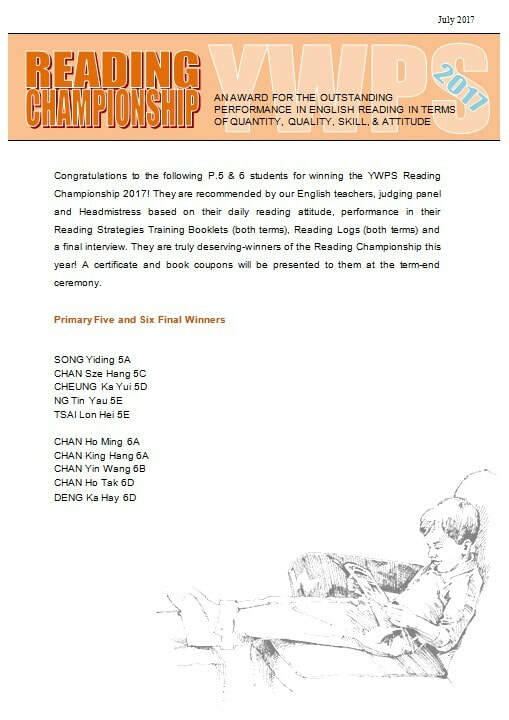 Book coupons were given to the children separately. 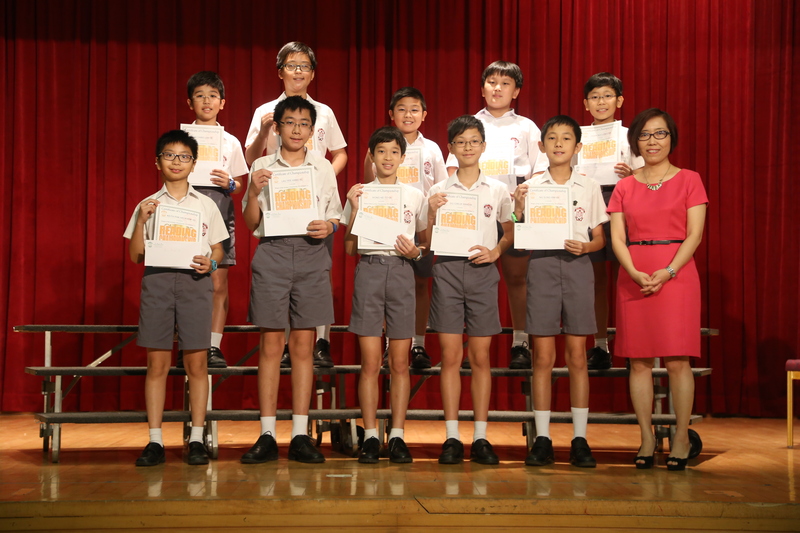 Vice Headmistress Miss Eve Lee represented the School Head to present the Reading Championship certificates and book coupons to the 10 deserving winners on 8 July 2015 at the year-end ceremony. 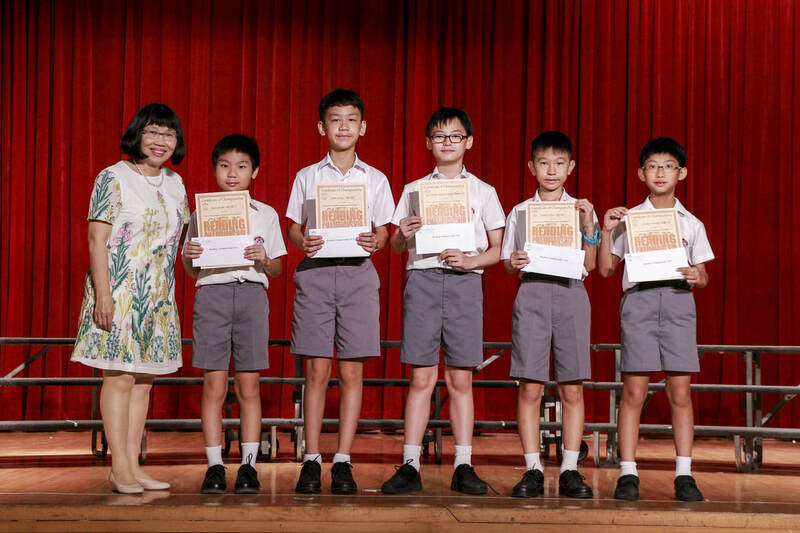 The 10 Winners from P.5 & 6 who demonstrated outstanding English reading habit and attitude were awarded on 9 July 2014 at the year-end ceremony. 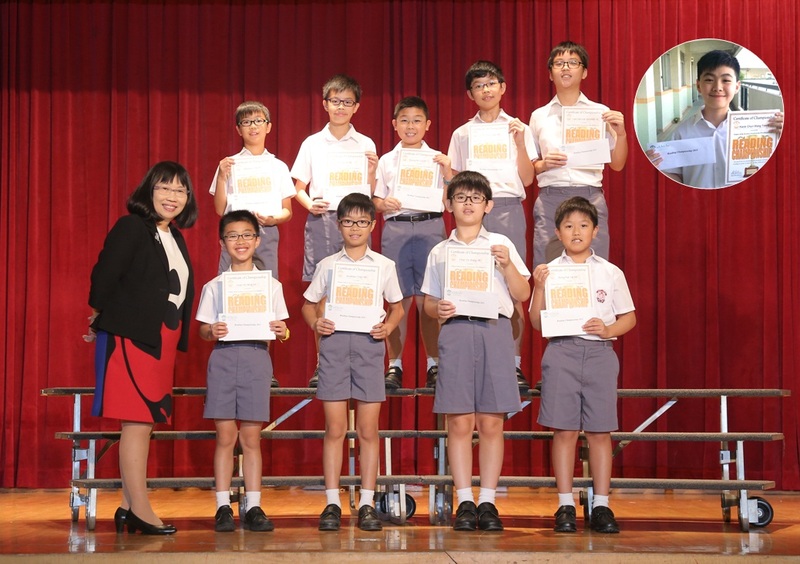 See the announcement file and the photo with School head Mrs Lam below.